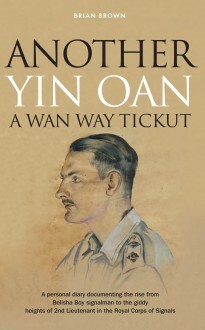 Another Yin Oan A Wan Way Tickut is Brian Brown’s personal diary of his rise from Belisha Boy signalman up to the giddy heights of 2nd Lieutenant in the Royal Corps of Signals between 1939 until 1945. Brian had a varied career in the Army including 3 ½ years as a prisoner of war after being ordered by CIC Percival to surrender to the Japanese at the fall of Singapore on 15th February 1942. The Diary takes Brian from Singapore to PamPong to work on building the new spur of railway which extended to Rangoon to join up with the existing railway. On the journey, in spite of the deprivation of hunger, illness & fatigue which accumulated from being held prisoner in appalling conditions, Brian worked with Indian elephants, herded cattle and ate any stray pigs which crossed his path – these experiences contributed to his decision to become a farmer later in life.